Attention, presale! This item will be available soon and will be despatched to you from 15.05.2019. Order already now and for your waiting-time you will receive a 25-pcs. AG-60 Wear Parts Set worth €34.90 FOR FREE! A professional cutter for everyday use ! Conviction through excellent cutting quality ! Plama cutting up to 14 mm thickness possible ! Compact design, very handy and easy to transport ! 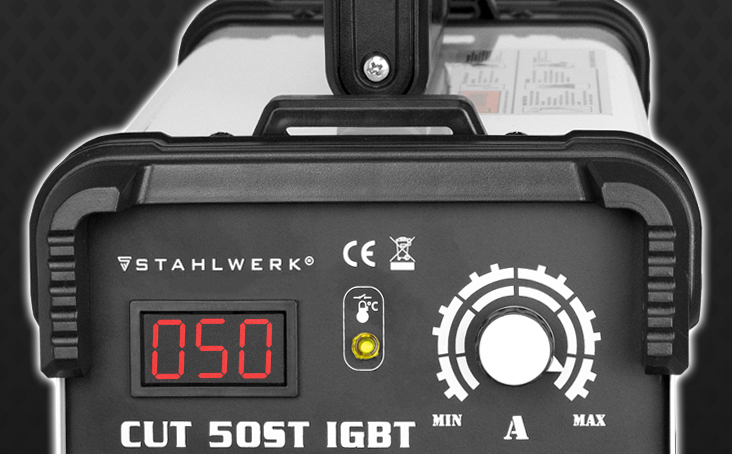 With the integrated Plasma Cutter CUT 50 ST can be cut without problems all conductive metals. For example: aluminum, steel, copper, brass, titanium and so on. Cutting power up to 14 mm Material thickness (depending on material). V2a up to 8 mm, Aluminum up to 5 mm. CUT contact - Absolutely easy-to-use HF high-frequency contact ignition. - A light stroke over the workpiece is sufficient. Fast cooling fan allows maximum power consumption and increases the operating time (ED) of the unit. Overheating -Control (O.C. - Overheating Control). Overheat protection starts as soon as the unit is overloaded. A yellow indicator light turns on and goes out as soon as the unit has cooled down again. The single-phase alternating current is to be protected in the household with a 16 A fuse. The welding machine is connected directly to the single-phase alternating current (AC) 230 V (+ -15%), 50/60 Hz operation. - Control panel conveniently accessible and easier to operate, - Intelligent fan guide. The welding machine Plasma Cutter CUT 50 ST has the most advanced inverter technology IGBT (Insulated Gate Bipolar Transistor). The resultant special features such as high speed and precision of the control give the devices their excellent quality in welding and cutting. - HF high-frequency contact ignition. - Switch integrated in handle. - Precise and very stable arc. - High duty cycle of 60% at 50 A. - Easy handling and low thermal spread. - Intelligent housing design with optimized airflow. - Clean cuts which do not require post-processing. - Powerful cutting speed, ensuring high productivity. - Maximum energy density with minimized heat distortion. - No material distortion due to heat metal waste is minimized. - A plasma beam that cuts any electrically conductive meal effortlessly. - Due to the low deformation, thin sheets can be welded together again immediately. - Low operating costs due to the use of air plasma, instead of expensive gases compressed air is used. Aluminum up to 5 mm. Make sure that the ground terminal and the workpiece have a good electrical contact; This applies in particular to painted or oxidized metal sheets and to metal sheets with an insulating coating. Do not attach the ground clamp to the workpiece that is to be separated. Caution: To ensure proper functioning of the appliance, the appliance must be cleaned at regular intervals with the compressed air from the accumulated metal dust. The Mettal dust can cause short circuits, which could lead to the guarantee being voided. The long-lasting design and the demanding welding properties of the machines ensure a reliable daily use for the production welding work. 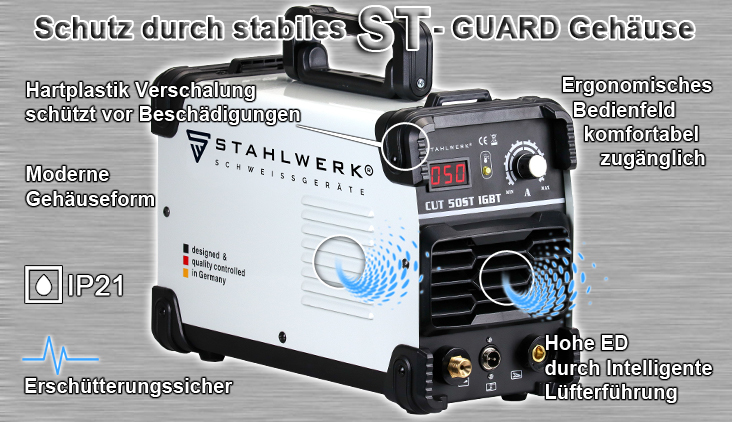 The machine Plasma Cutter STAHLWERK CUT 50 ST IGBT. Plasma hose "AG-60" / "SG-55" 5 meter. - 1 nozzle (already at the plasma torch). - 1 electrode (already at the plasma torch). - 1 ceramic cap (already at the plasma torch). Depending on the ordered accessories, we will ship a second package with UPS. This is free for you. We want to avoid transport damage. Although both packages leave our house at the same time, in some cases, the machine comes first and the accessories are delivered one day later. This is not the rule, but it happens.